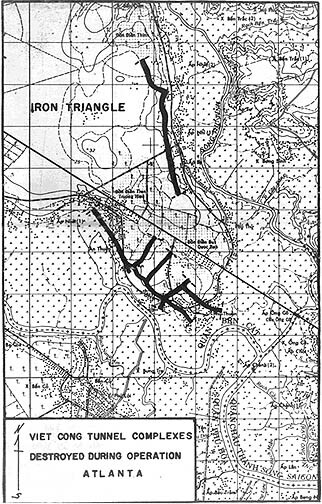 2ND BDE - U.S. Army tunnel rats aided by members of the Vietnamese Province Reconnaissance Unit (PRU) have uncovered what 25th Div intelligence officials believe to be the main Viet Cong underground infiltration route through the Iron Triangle centered 48 Kms north-northwest of Saigon. 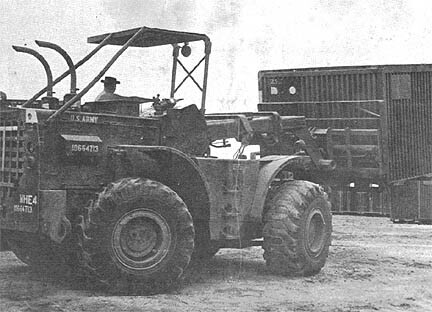 The tunnel complex was uncovered during the land clearing portion of Operation Atlanta. According to 1LT Thomas Seitzinger, a 4th Bn, 23rd Inf, platoon leader, his team of tunnel rats have searched some five miles of the tunneling which generally runs in a north-south direction. The exact length of the tunnel network is not known, however the PRUs stated that it takes three days and nights to travel its length. At several points the main passageway is interrupted by side tunnels which, according to the PRUs, runs to Ben Cat on the eastern boundary of the Triangle and to the Ho Bo Woods on the west. "Every time we'd reach a point where the tunnel had collapsed from Air Force bombs the PRUs would look around and say 'dig there' and sure enough we'd find it again," explains Seitzinger. Seitzinger explained that the Viet Cong dug their tunnel by sinking shafts at various distances to certain depths. They then dug connecting tunnels. This was repeated over and over again. After the tunnel was completed the shafts were filled in. The PRUs can spot the location of the shafts by the slightly different color of the ground and vegetation around the shafts. SSG Donald Neves of Greenville, S.C., has much admiration for the PRU's as he has worked and lived with them for the east 14-months. "They would save your life in a minute," said Neves. Recently one PRU they call "Joc" was walking point, and spotted an anti-personnel mine about 50 meters away, he was credited with possibly saving the lives of several men, explained the two year veteran of Vietnam. "Crawling through the tunnel has been kind of nerve wracking at times," remarked one of the tunnel rats. "We've encountered snakes, spiders, bats and ants, Viet Cong bodies and dud rounds and booby traps that we had to take out first," he continued. The 18th Military History Det has a requirement for a limited number of artists to work in the 25th Inf Div Combat Artist Program. Talented personnel interested in performing as combat artists should submit through channels three samples of their work to the Division Adjutant General. 3RD BDE - As part of a 25th Div program, two Vietnamese soldiers have recently been assigned to the reconnaissance platoon of the 2nd Bn (Mech), 22nd Inf. Nguyen Van Thanh and Nguyen Van Ton were selected to attend the Quang-Trung Military School in Saigon, after which they were attached to the 3rd Bde, 25th Div, for duty with American units. Their assignment to the reconnaissance platoon of the 2/22nd at first brought some mixed reactions from the members of the platoon. The men felt that the language barrier would prove too great, and were hesitant about having the two Vietnamese with them. They couldn't have been more mistaken. Platoon Sergeant SSG Ray Russler, from Lewistown, Pa., remarked, "When they came into the platoon, we showed them how to operate the different weapons and how to drive the APCs. We only had to show them once." Thanh, from Tay Ninh, has become exceptional with the .50 cal. machine gun and can disassemble and reassemble it faster than anyone else. The GIs have also benefited from the merger. Thanh and Ton have lived in the area, and know the countryside. Their knowledge of VC tactics is being passed on to the Americans. 2ND BDE - A dust-off was out of the question - the patient weighed 800 pounds. They could have put him out of his misery and faced the reaction of the half-angry, half-curious crowd of Vietnamese. So the men of Bravo Co, 1st Bn, 27th Inf "Wolfhounds," did the only thing possible: they called for the doctor to come to them. While the soldiers eyed the farmers and the farmers eyed their wounded ox, CPT Clark A. Gwin from Centralia, Mo., and an assistant hopped aboard a helicopter for their first "house call" in Vietnam. Moments before, a Wolfhound had wounded the animal when it charged him during a search and destroy mission on the 25th Inf Div's Operation Saratoga. Gwin, the division veterinarian, arrived to find the animal tied, the wound in its left rear leg already cleaned by a medic. Working with his assistant, SP4 Wayne R. Gromely of Port Angeles, Wash., the veterinarian sutured a severed tendon and bandaged the animal's leg. "The people looked worried about the animal," said the doctor. "So I just had the interpreter tell them how to change the bandage and not to work the animal for a week, and it would be okay. Elements of two Viet Cong regiments tried unsuccessfully to overrun the 25th Inf Div's fire support base Burt on the evening of Jan. 1 and morning of Jan. 2. More than 355 communists of the 271st and 272nd VC regiments were killed in the 10-hour truce-shattering battle. See next week's Tropic Lightning News for details. 1ST BDE - U.S. Air Force Control (FAC) pilots and the 4th Bn, 9th Inf, have combined to spot and destroy three regimental-size Viet Cong base camps during the opening phase of the 25th Div's Operation Yellowstone. A spokesman for the infantry battalion said that until recently the camps had been home for the so-called "palace guard" - the Viet Cong regiments guarding COSVN headquarters. Flying for the 1st Bde, Air Force MAJ Bogue Harrison of Downs, Kans., discovered the first site. It lay about 5 kms south of the Cambodian border and 5 kms west of the brigade's base camp at Katum. Harrison called in to blast off cover over the camp with three air strikes that dumped over 15,000 pounds of bombs on the installation. Meanwhile, on the ground the Manchus had been operating in the same general area. They uncovered 440 tons of rice and had killed seven Viet Cong in a brief but furious fire fight while sweeping just to the south. With the report of the base camp sighting, Bravo and Charlie companies moved in for the search. They found a complex measuring 1500 meters in diameter containing 15 bunkers approximately 12 by 20 feet to 14 by 40 feet, and some 20 of smaller dimensions. Many had been destroyed by the air strikes and there were pools of blood on the ground. The camp yielded 400 pounds of rice; 40 pounds of plastic explosive; 5 bicycles; a typewriter; finance records for 10 VC companies; a CHICOM and a Czechoslovakian rifle; a large pig and 57 chickens - the main course of an impromptu barbeque the men enjoyed. The next day the infantry-FAC team was in operation again, zeroing in on a second regimental base approximately 1,000 meters northwest of the first. The most elaborate of the three, this site contained thirty 30 by 60 foot living hootches and a field hospital of similar size. The searchers from Bravo Co found one area that had been cordoned off by barbed wire. Battalion officers determined it was a prisoner-of-war compound after finding a booklet of instructions on running a POW camp. It was written in Vietnamese. The direction included phrases in English for use in handling and interrogating American captives. There was no sign the compound had been occupied. Also found in the base was an AM radio-telephone; two AK-47 assault rifles, a 15-pound CHICOM claymore mine and several of U.S. manufacture; two Russian anti tank mines; and five rifle grenades. Only 700 meters to the east, the ground-air team uncovered the third camp. This site had been abandoned only a short time and was in the middle of a maze of wide, smooth trails that showed signs of recent bicycle and even truck traffic. Charlie and Delta companies seized 6 new RPG-7 rounds still wrapped in their protective cellophane; 30 unopened crates of AK-47 ammunition; 22 rounds of 82mm mortar; 12 rifle grenades; and a CHICOM field telephone. What's ahead for you in 1968? What do the next 366 days have in store? These are rather difficult questions to answer. 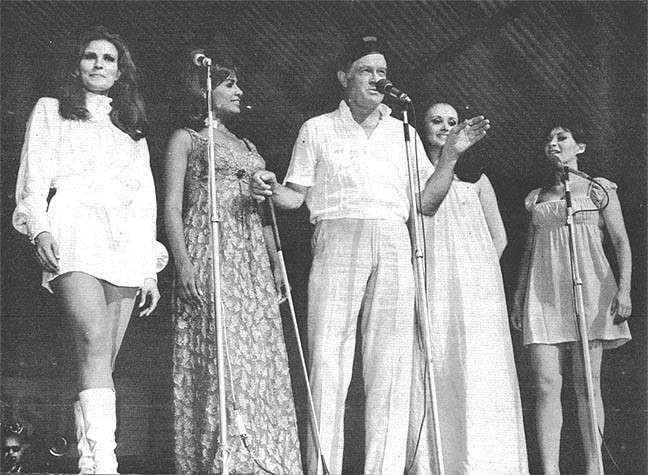 However, there is one thing you can be sure awaits you in 1968 and that is opportunity. There is the opportunity to become more skilled in your profession; to learn more of what is happening around you; to gain skill in a field that may be new and different; or to become more knowledgeable in your dealings with others. All these and many more opportunities are waiting for you in the year ahead, but you must be alert and willing to work to take advantage of them. You can't sit back and simply wish good things will come to pass. Hard work is the only thing that can make dreams and wishes come true. At this time of the year, we have a tendency to make a number of resolutions to improve our lot during the coming year. Unfortunately, most of these resolutions are forgotten by the end of the month. So, rather than making a long list of resolutions, make just one resolve. Resolve to take advantage of every opportunity for improvement that presents itself in the coming year. SAIGON (MACV) - More than 500 letters praising U.S. Forces members and wishing them a Merry Christmas were sent by Vietnamese high school students in Saigon to the Office of Information at MACV headquarters. Carefully written in English, the letters cite the sacrifice of Americans here, hope for long lasting friendship between the Vietnamese and the U.S., and the traditional expression of good will during the holiday season. The authors of the letters are members of Nguyen Duy Khang High School. Wrote one student, "When thinking of benefactors, I can't help thinking of you who have come a very long way to help our people fight communist aggressors . . . Be sure of our gratefulness for your presence in our war-torn fatherland. The hardships you have been undergoing together with the Vietnamese people will make the friendship between our two people an ever-lasting one." Another wrote, "Everyday I go to school . You are a young man who is fighting for freedom and for the independence of my nation, and now day and night you live in danger. Your sacrifice and your comrades' are so great. I know this and I think that all Vietnamese students know this." WASHINGTON (ANF) - U.S. Army officals are giving the Army Language Aptitude Test to certain Regular Army enlisted personnel whose records do not contain at least a minimum score on the test. In Department of the Army Message 841647, the Office of Personnel Operations reminds commanders that AR 611-82, "Selection of Personnel for Language Training," requires that the language aptitude test be given to all qualified RA enlisted personnel. Increasing world-wide requirements for linguists make strict compliance with the regulation mandatory, the message says. The message requests that the records of RA enlisted personnel be reviewed so that men will be tested or retested by Jan. 31, 1968, if they meet the qualifications in AR 611-82, but do not have a minimum test score of 18 or higher in their records. For enlisted men, qualifications include completion of high school or its equivalent, General Technical Aptitude Area (GT) score of at least 100, and completion of basic and advanced individual training. Also, to be eligible for language training, applicants must have 14 months service remaining upon completion of a 24-week language school course, 18 months after a 37 or 47-week course, 13 months after any course in Vietnamese which is more that 12 weeks long, and six months after completing Vietnamese language training on a temporary duty basis. WASHINGTON (ANF) - The Educational Assistance Program for U.S. Army dependents is now in its fifth year. 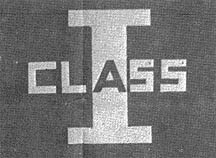 The program began in August 1963, when The Adjutant General of the Army and officials of the National Merit Scholarship Corporation (NMSC) signed an agreement in which the Army dependents graduating from high school who are declared finalists, semifinalists, or commended students by the NMSC. Scholarships based on financial need as determined by the NMSC range from $250 to $1,500. Funds for this program are provided by the Army Central Welfare Fund. To be eligible for an Army Merit Scholarship or an Army Educational Assistance Loan, a student must be a dependent of an Army member who is on active duty as of Jan. 10 of the student's senior year in high school. The student must take the National Merit Scholarship Qualifying Test in March of his junior year in high school. Detailed information about the Army Educational Assistance Program is contained in AR, 350-16 and DA Pamphlet 608-3. Beginning in April, certain U.S. Army and Air Force units in Europe will be redeployed to the United States, the U.S. Commander in Chief, Europe, announced Dec. 20. The announcement by Gen. Lyman Lemnitzer said planning action is underway and the redeployment has been the subject of consultations in NATO since last spring. At that time the U.S. proposed to redeploy up to 35,000 military personnel from the Federal Republic of Germany. The redeployment, involving about 31,000 Army personnel and 3,400 Air Force, will continue over a number of months. Army units involved are two brigades of the 24th Inf Div, and the 3rd Armored Cav Regt. 2ND BDE - A careless Viet Cong recently saved the lives of several 25th Inf Div soldiers during Operation Yellowstone when he alerted them to impending danger. Helping to secure the growing Katum base camp being carved out of the jungles of War Zone C, troops of the 1st Bn (Mech), 5th Inf's Alpha Co, had been filling sandbags and building bunkers all day. As darkness set in, they continued preparing for the recurring mortar attacks. "We had just finished placing the final row of sandbags on the bunker walls," said SP4 Robert Cribb, a team leader from Piscataway, N.J., "when all of a sudden a trip flare went off down the line and our men opened fire." The team leader and three other men immediately dove into the roofless bunker while three more mounted their armored personnel carrier to man its machine gun. "We thought we were going to be attacked," added SP4 Clarence Klausing of Louisville, Ky., a forward observer. Seconds after the men scrambled for cover, an enemy mortar round landed in front of their bunker, a short five feet away from where they had been standing. "If Charlie hadn't been so curious to see what was going on, he would never have tripped the flare," commented PFC Joseph Misiaszek, a rifleman from Central Falls, R.I.
"It's a good thing he did, or we might have ended up in a heck of a bad way. That round landed too close to where we'd been standing for any of us to have got away unhurt." 2ND BDE - An American civic action team guarded by Vietnamese forces had to fight its way through a barrage of enemy fire to give medical treatment to residents of a Hau Nghia Province village. 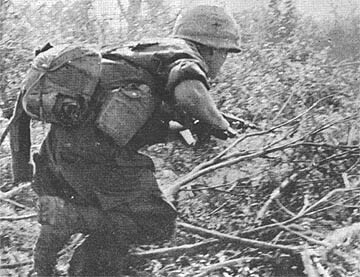 Five Viet Cong and several weapons were captured by ARVN forces in the action around the village of Hau Hoa. According to 1LT Stan McKee, civic action officer for the 25th Inf Div's 1st Bn (Mech), 5th Inf, Viet Cong armed with automatic weapons opened fire on the friendly column as they moved into the northern edge of the village. 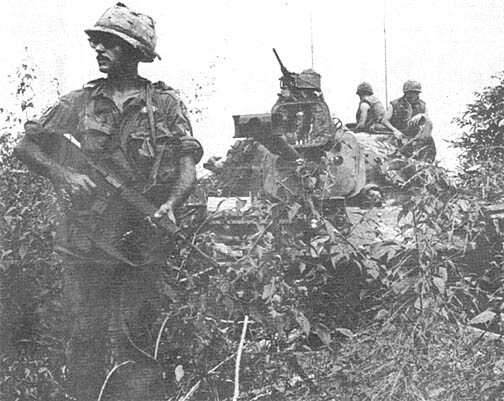 The Vietnamese troops returned fire, chasing the five enemy into another company of the 2nd Bn, 49th ARVN Regt, which was moving towards the village from the south. McKee, a native of Atlanta, Ga., said that after the action was over "the villagers were very receptive." "After our medics treated them for about two hours, the villagers brought us food and seemed very glad we'd stopped by," he said. 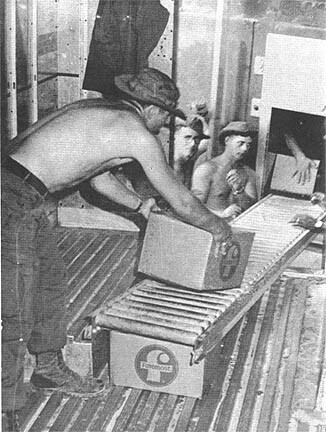 1ST BDE - Tunnel rats are constantly proving that it's almost as dangerous below the ground in Vietnam as it is above. Take SSG Charles E. Howell of Houston, Tex., for instance. He recently headed a three-man team of tunnel rats that explored diggings uncovered by Alpha Co, 4th Bn, 9th Inf. After wriggling through the tiny entrance, the trio crawled down the long passageway without incident. The tunnel ended in a rising vertical shaft with niches cut in the sides and a rope hanging in the center. Spurred by typical tunnel-rat curiosity, Howell decided to see where the rope led. He had climbed only a short way, when he felt something slam into his shoulder, numbing his side. Struggling to keep his grip on the rope, he looked down at the bottom of the shaft. Another team member had trained his flashlight on the missile that had hit Howell - a CHICOM grenade. Luckily it had failed to detonate. The three men began to breathe again as they retraced their steps to the surface, deciding to let the demolition team take care of the tunnel. 1ST BDE - It's been a white Christmas for PFC Danny R. Adams - in fact he's almost been snowed under by a blizzard of cards and letters from home. "For a while," said one of Adams' buddies, "whenever we got in a couple of sacks of mail, it seemed like they'd automatically bring one down and give it to Danny." Adams, a radio-teletype operator in the 1st Brigade's Communications Platoon, received an average of 15 letters a day during the first three weeks of December. "They were all from my home town," the Rockfish, Va. native said. "But about three-quarters of them came from people I'd never heard of. Finally I wrote my folks and asked them what was going on." His family replied that a local paper had printed the names of the community's servicemen and asked that readers drop a line to them to show support for their efforts. "It's a great idea," Adams said. "It's really encouraging to know people back home are behind you." The soft-spoken Virginian is now keeping his mail safe in a laundry bag at the brigade's forward base at Katum. "I've answered a few of the letters," he said, "but it'll be impossible to reply to ahem all individually, so I'm going to write a letter to the paper to tell them all how much I appreciate their writing." 2ND BDE - A platoon leader arriving at his new 25th Inf Div assignment literally jumped out of the chopper and into the fire, winning a Combat Infantryman's Badge within minutes. 2LT Stewart Eiden of Pasadena, Calif., hopped off a resupply helicopter as he reported to the 1st Bn (Mech), 5th Inf, forward base camp in War Zone C.
While introducing himself to his platoon, Viet Cong gunners opened up on the base camp with automatic weapons and recoilless rifles. Eiden organized his men and assaulted through the perimeter to the suspected enemy location. After the fight, LTC Fremont B. Hodson Jr., battalion commander, pinned a Combat Infantryman's Badge on the new "Bobcat." "I think he did a fine job for a man who hadn't a chance to settle down and learn the routine before his first combat action," Hodson explained. "It was a hot one all right," commented Eiden. "It looks like the VC are going to be my best teachers." 1ST BDE - The Viet Cong started the encounter with automatic weapons - the Manchus from Alpha Co, 4th Bn, 9th Inf, ended it with a blast. 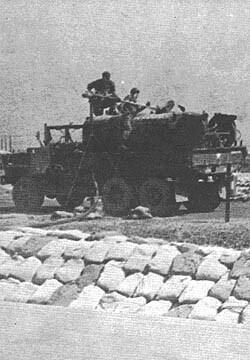 Sweeping an area southeast of Tay Ninh, the U.S. troops received heavy automatic weapons fire. They returned the fire and the enemy was silent. Moving forward, the Manchus were met with a hail of CHICOM grenades. They spread out and began trading grenade for grenade with the enemy. Finally SP4 Jerry Mullinix of Adrian, Mich., ended the duel. After tying six blocks of explosive together, with a hand grenade blasting cap as a firing device, Mullinix crawled up to the slit in the ground from where the grenades had been coming. Pulling the pin, he tossed in his homemade "super-grenade" and did a rapid low-crawl back to his buddies. When the dust settled, Manchu tunnel rats investigated the tunnel that the blast had exposed. 3RD BDE - During a recent mortar attack on the 3rd Bde, 25th Inf Div's base camp, a 2nd Bn, 12th Inf, officer had a very cool shower turn into a very hot one. 1LT Tommy Giles III of Marina, Calif., Bravo Co's executive officer, had just finished a nice, cool, refreshing shower, when he heard the first of the incoming mortar rounds hit. "I wasn't sure if they were incoming rounds, but just as I stepped out of the shower," related Giles, "a round exploded 25 meters from me." Immediately Giles headed for the safety of the nearest bunker and its protection from the incoming rounds. The next round that came in was a direct hit on the now vacated shower. The 25th S&T Bn can be justly proud of their motto: Without Delay. They have earned it. The battalion has the responsibility of supplying all divisional, plus attached units, with the materials for completion of their mission. 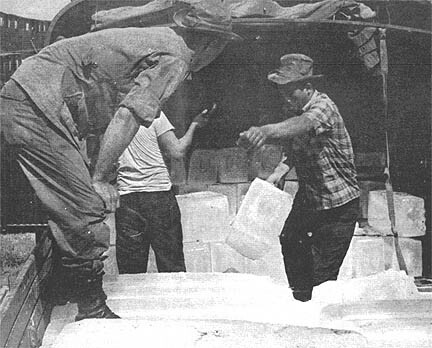 They also must transport the goods from Tan Son Nhut and Saigon to Cu Chi, Dau Tieng and Tay Ninh. The battalion is organized into three companies: Headquarters, Supply and Service, and Motor Transportation. The battalion is commanded by LTC Robert Schwarz. Headquarters Company supplies the battalion with all the mess hall personnel and all of the staff at battalion level. The Supply and Service Company receives, stores and issues materials for all divisional units, plus attachments. The Motor Transportation Company is responsible for transportation of materials from Saigon and Tan Son Nhut to Cu Chi, Tay Ninh and Dau Tieng. Thanks to S&T the supplies are kept flowing at a quick smooth pace. CONEXS ARE LOADED WITH GOODS AND STACKED IN THE CLASS II YARD. 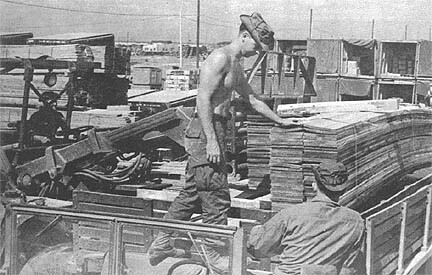 LUMBER IS LOADED ONTO A TRUCK AT THE CLASS II YARD. AVIATION FUEL IS PUMPED INTO TRUCKS. MILK IS OFF-LOADED FROM A TRUCK. ICE IS LOADED ON A TRUCK AT THE ICE ISSUE POINT. 2ND BDE - At first they thought the voices coming from the deep rice to their front belonged to the three-man listening post returning to the perimeter. They continued to huddle in the bunker, trying to keep warm in the crisp early morning air. Then the first of nearly 200 mortar rounds began to fall all over the base camp and the Americans knew they were in trouble. "We'd just heard voices - VC voices - from the paddy when one RPG round landed behind the bunker," recalled one soldier of the 1st Bn, 27th Inf "Wolfhounds." Shrapnel hit two men; all four in the bunker were shaken by the concussion. "We started to fire to our front. They started dropping flares, and we could see about 20 VC hitting us in groups of four or five," the Wolfhound continued. Before it was over, the 25th Inf Div soldiers had killed 41 enemy who staged a fanatical, abortive assault on the battalion's forward base camp. Although the defenders first thought the enemy to be Viet Cong, intelligence officers later identified them as members of the 2nd Bn, 101st North Vietnamese Army Regt. Ten Wolfhounds were wounded in the assault, which backfired when an enemy diversionary assault failed to materialize. But it was touch-and-go at moments. "A couple of them had gotten inside the perimeter," said SP4 Robert Caruthers of Middleport, Ohio. "There was a position about 50 meters to our left and we could see a VC with an RPG moving into the hedgerow between them and us." SGT Robert Matamoros, a squad leader from Westaco, Tex., landed a grenade between the enemy's legs. "He went down, but he was alive and trying to fire. We finished him off with an M16," he said later. To Caruthers' left, the three man position occupied by SGT Craig DeFyter and two men of his fire .team had opened up on the advancing communists. "The listening post was still out to our front, so we had to hold our fire to the left side of our sector," DeFyter recounted. "Finally, we saw the L.P., coming in with the VC right behind them. We just counted three men, then fired at anything that came along behind," he said. The listening post reached safety to the left of DeFyter's position. Meanwhile, artillery and mortar fire was pouring on the rice paddy and far edge of the perimeter in a desperate attempt to halt the communist drive. On the other side of the base camp, an ambush patrol spotted a 70-man enemy force approach the perimeter, then mysteriously veer sharply away. On the north, in Charlie Co's sector, the battle raged on. "We were still firing to the front when one VC came in from behind. He fired in the bunker and got Baker in the foot," Caruthers said. "I swung around to fire, but he ducked away and headed outside the perimeter." PFC Joseph B. Baker, with a carbine wound in his foot, scrambled out of the bunker and fired his grenade launcher. "The round landed right next to him and I didn't see him anymore," the infantryman from Lovelander, Colo., remarked. For the next half hour, 'the Wolfhounds engaged four-man enemy teams trying to penetrate the perimeter, despite the heavy fire enveloping the paddy. "They'd try to come in, and if we didn't kill them with small arms, we'd just pin them down until the artillery and mortars got them," Caruthers said. When the attack slackened about 3:20 a.m., one and one-half hours after it began, a medic made his way through sporadic fire to treat the men in the bunker. All four were evacuated, replaced by the listening post. In the paddy to their front, 34 communists lay dead by their gear and weapons, 11 of them within 2.5 meters of the perimeter. Three had died inside the base camp. Searching through nearby hamlets, Wolfhounds discovered four more bodies. Heavy blood trails dotted the area, indicating more enemy had been killed or wounded in the fighting. In a stockpile near the battalion command post lay four AK-50 and one AK-47 assault rifles, one carbine, three RPG-2 rocket launchers, two Russian light machineguns, 1,000 rounds of small arms ammunition, 115 various type grenades, 15 enemy mortar rounds and 13 rounds for rocket launchers. 1ST BDE - "You wear a steel pot and flack jacket and what saves your skin - something that was never intended to defend you." SP4 Gerald Mitchell of Fort Worth, Tex., was commenting on the close call he'd had recently while serving with the Recon Plt of the 2nd Bn, 14th Inf. Mitchell was part of the first patrol sent out from his battalion's perimeter at Katum as the 1st Bde consolidated the base camp for the 25th Div's Operation Yellowstone. As the patrol moved down a trail some 300 meters outside the perimeter, Mitchell spotted what appeared to be the foundation of a hootch. As he went forward to check it out, the Viet Cong opened up. "I hit the dirt fast," the Texas soldier said. "Charlie was close, maybe within 20 meters. I began returning the fire when suddenly I felt something hit my left side and slam me back." Shaken, he began to look for blood. Unable to find any, he opened his shirt and found a red hot AK-47 round nestled next to his skin at his belt line. The bullet had passed through Mitchell's ammunition pouch, magazine ammunition and web belt. "All I got out of it was bruised ribs, and a small burn." 3RD BDE - A 15-man reconnaissance patrol dropped into a VC hornet's nest near here recently and dropped out again after killing four of the enemy. There were no U.S. losses. The 25th Div troopers, part of the Recon Plt, 3rd Bn, 22nd Inf, were dropped into the area west of Dau Tieng to set up daylight ambushes and check enemy movement in the area. Moving to their first position, a small enemy base camp was discovered. "The floor of one of the bunkers just didn't feel right," related 1LT Richard J. Prairie of Kankakee, Ill., the patrol leader, "so we decided to dig." Seventeen bolt-action rifles were found concealed under the false floor. A two-ton cache of rice was found under another bunker in the complex. Carrying the captured weapons with them, the men moved on. Moments later the chattering of about 15 Viet Cong halted the "Tropic Lightning" soldiers. Down the trail came a patrol of khaki-clad VC armed with AK-47 rifles. Waiting until the VC were only a few feet away from the point man, SP4 James E. Boggess of Jacksonville, Fla., the GIs opened fire and killed four of the enemy patrol. Suddenly the jungle was ablaze with tracers as what Prairie described as "at least 20 automatic weapons" opened up on his small unit. Jet fighters overhead began to make strafing runs within 15 meters of the patrol's flanks as they began to withdraw. Helicopter gunships from the 188th Aslt Hel Co took up where the fighters left off in covering the patrols withdrawal. "The choppers wanted us to mark our position with smoke but we had thrown all our smoke grenades for the jets," said Prairie. "Then Colonel (LTC Thomas U.) Harrold came in low over the treetops in his helicopter and dropped us some grenades." With the airdropped smoke grenades, the patrol marked its position and three helicopters swooped in and pulled them out as 105mm artillery began to pound the area. 2ND BDE - A forward air controller's final pass on a routine reconnaissance mission recently led to the deaths of four curious Viet Cong. 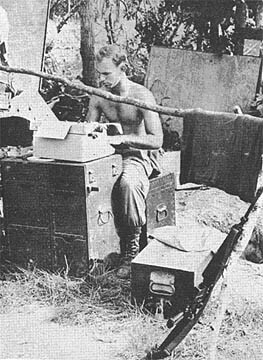 Air Force CPT Harry E. Garrison of Elmer, N.J., was about to return to the 2nd Bde, 25th Inf Div, base at Cu Chi when he spotted ten armed Viet Cong digging a trench on the northern border of the HoBo Woods. "They were just sitting there watching me," Garrision said, "so I just circled around andwatched them." 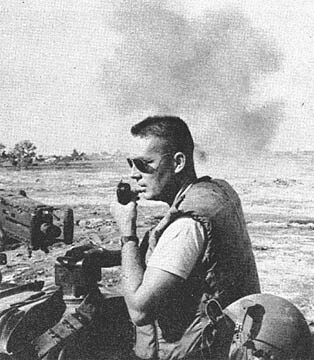 Calling for armed helicopters, artillery and an air strike, the captain directed fire on the communist troops, resulting in four Viet Cong killed. "They didn't even try to get out of the area," Garrison said. "Even when the artillery was dropping, they just ran around in circles. "I guess at first they were curious. The funniest part of it was that I looked down on them, they looked up at me, then they just kept on digging." 2ND BDE - A 25th Inf Div team leader lost a steel pot and gained four souvenirs when an enemy armed with an assault rifle shot him in the head. Fortunately for SGT Craig A. DeFyter of Holland, Mich., the steel-jacketed bullet ricocheted around the top of his helmet liner before jamming between it and his steel pot. The incident occurred as the 2nd Bde soldier was helping fight off a communist assault on a forward base camp of the 1st Bn, 27th Inf "Wolfhounds." When North Vietnamese gunners opened fire with mortars and automatic weapons on the base camp, DeFyter and the two men in his position began to spray the rice paddy to their front with fire. "I was firing to the far left when someone out there shot an AK-50," DeFyter recalled. "The sound got to me about the same time as the round. It felt like someone hit me in the side of the head with a sand bag as hard as the could." DeFyter's helmet flew nearly 10 feet out of the position. Stunned by the impact, he was later evacuated for medical treatment. When friends returned the headgear, DeFyter found the bullet had entered the front of the helmet, ripped through his girlfriend's letter in his helmet liner, then stopped on the right side. "The first sergeant said I could keep it as a combat loss," DeFyter noted. "Now I've got four souvenirs - the letters, the liner, and I'll probably be the only guy in town with a hole in his steel pot and the round that made it in his pocket." 3RD BDE - An almost starved fawn, abandoned by its mother in the jungles of War Zone C was found by the men of the 3rd Bde, 25th Inf Div, recently during a combat assault into the swampy jungle west of Dau Tieng. SP5 Lawrence Jenness from Fairfield, Maine, spotted the small, brown baby deer as Co A, 3rd Bn, 22nd Inf, was moving off the landing zone. Jenness, head medic with Co A, picked up the fawn which was too weak to run. "It had become so weak that the creature surely would have perished in a few more days," commented the medic. After several thousand meters of traveling through thick bamboo, the company finally stopped for the night. The exhausted medic sent the fawn into Dau Tieng on the resupply helicopter. Alpha Co's new mascot is rapidly regaining his strength back in its new home. 1ST BDE - A well-worn trail deep in War Zone C recently led to the end of the line for a Viet Cong platoon leader and six of his men. Co B, 4th Bn, 9th Inf, discovered the six-foot wide footpath in dense jungle near the Cambodian border. The unit was on a search and destroy mission as part of the 25th Div's Operation Yellowstone. Because of the fast-approaching dusk, CPT Alfred W. Baker, company commander from Oak Hill, W. Va., postponed a detailed search of the area until the next day, when his men were reinforced by Co C.
The two Manchu companies moved out at dawn. Intelligence reports indicated the presence of several hard-core Viet Cong and North Vietnamese elements in the general area. About 500 meters from the perimeter, the whole world seemed to explode. Co C had made contact with the perimeter of a platoon-sized VC base camp. For 15 minutes the air was solid lead as machine guns, AK-47s and M-16s sought out each other's positions. Bravo joined the battle on Charlie's left flank, and together the two Manchu companies silenced the determined enemy. Through the dusk and smoke, the VC were seen dragging nine or ten comrades into the brush. Seven bodies were left behind - among them that of a soldier identified by documents found in his wallet as a lieutenant - a member of the Communist party for 20 years. 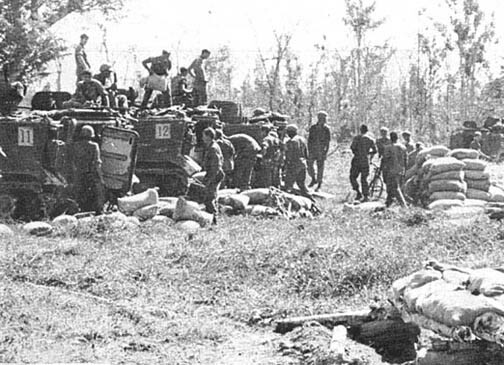 DIV ARTY - When the twelve 105mm howitzers of B and C batteries, 1st Bn, 8th Arty, moved into position at Fire Support Base Maryland, priorities had to be met. Since the range of the howitzer depends on the elevation of the tube, all obstacles must be cleared for the flight of the projectile. When dense jungles and lofty trees outlining the perimeter of the fire support base, the trees had to go since they were in the line of fire. Using demolition charges, MAJ Jesse Ramos of Phoenix, Ariz., the 1st Bn's executive officer, packed the hollow of the obstructing trees with the explosives. In less than an hour both batteries could provide pinpoint artillery fire in any direction. 3RD BDE - Christmas is the time of year for giving and doing for others. This was what the men of C Co, 2nd Bn, 12th Inf "White Warriors," had in mind when they gave a Christmas Party for some of the children from the village of Dau Tieng. There were 42 happy, smiling faces there. At first, the children were just a little shy. After the candy, hotdogs, hamburgers, and ice cream were served, Santa Claus arrived on the scene. Once the children saw the many gifts Santa had to give away, it took a lot to control them. It seems that the little children were really fascinated by Santa Claus and had learned something about the meaning of Christmas. The two men of the 3rd Bde, 25th Inf Div, really responsible for the party were SGT Kenneth L. Anderson and SGT David N. Glass. These two men had written home to their parents and friends telling them of their plans. The response was tremendous. They, along with other men of the company, started receiving packages from family and friends as well as churches and clubs. They took stock of all they had and really came up with a terrific party for the children of the village. "It really was fantastic the way the men contributed their time and energy toward the party," said CPT Vernon Smith, "They were really thinking of others and truly have the Christmas Spirit." 3RD BDE - Over 18 tons of polished rice and four bicycles stored in multiple hidden caches have been found by Bravo Co, 2nd Bn (Mech), 22nd Inf, in a sweep near the Saigon River, 72 kms upstream from Saigon. As part of a search and destroy conducted by the 3rd Bde, 25th Inf Div, the 3rd Plt was sweeping down a jungle path with security out 30 meters on the flanks when they ran into the first 18 bag cache. The rice had been stacked in 100 pound bags, placed on logs to keep it off the ground, and covered with plastic. A small trail led from the main path to the cache, and had bent branches and small bits of paper to distinguish it from the hundreds of other trails in the area. As the platoon continued down the path they found 12 more trails with the camouflage marking, each with an 18 to 25 bag cache at the end of the trail. Most of the rice had been placed on raised log platforms with tin sheeting, 10 feet by 12 feet in diameter. Two permanent caches in 8 foot deep bunkers were also found.